The ipad - pulled forward to allow me to access the screen with minimal effort (!). The hole punch is a remnant from some book keeping and will be banished now that I've noticed it's still there. There's a sheet of cheerful wrapping paper waiting to be put back in the wrapping paper box; I managed to make the present fit into one sheet for a change. then there's some Kraft card and a No 6 stamp. The significance of that is not wasted on you I know. Also, I rashly brought a pack of Project Life cards. Well why not. I've got some divided page protectors and no clue as to how best to use them...might as well throw money at them! I really need a new trolley bag tote thing..want to recommend one? That's my tale for the week then people, now let's hear yours! Please put WOYWW in your post title. Your post needs to be desk relevant too! Link up here and we'll visit. Some, I must say (ME), visit very sporadically and slowly...do not adjust your set. I can't even remember the stamp manufacturer name...someone will. I faithfully copied the colours off the picture on stamp set packaging! 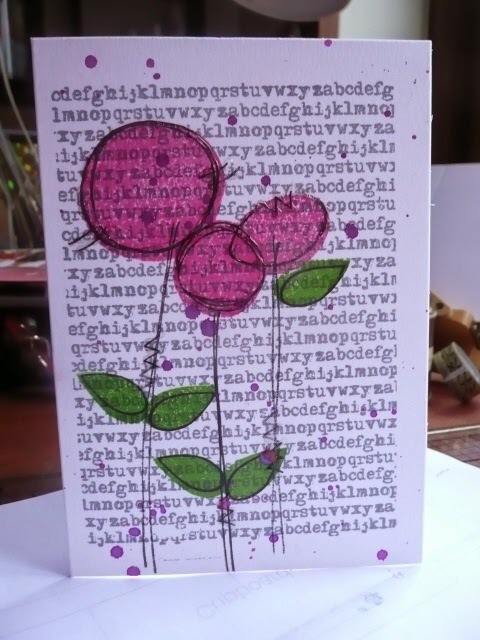 I do like the image very much, but now I've done it like this, I just know that any other time I use the stamp set, my card will look VERY like this. Again. And probably again. I wonder if Micro Niece would notice next year! My confidence gets very wobbly when presented with a 'cute' requirement. Although I always like other people's. What with not doing cute and not doing men's cards, I'm really narrowing my field! We all seem to be very aware of the amount of stash we have. And during this fiscal austerity, we all seem to be trying very hard to use up what we've got. I'm no different. 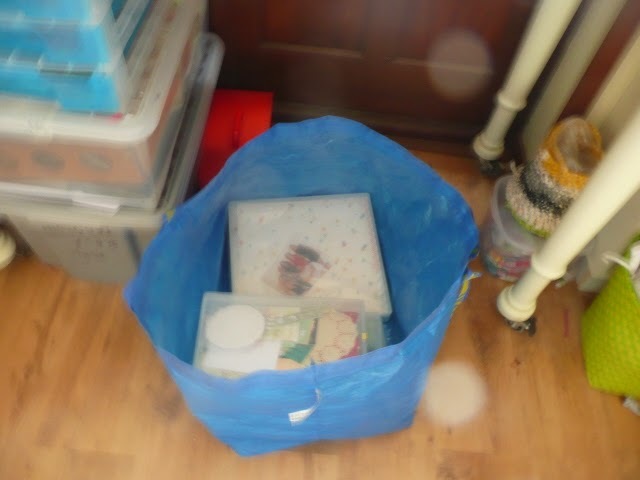 You may remember at the beginning of the year that I had a bit of a sort out and put the oldest of my papers on the top of my 12x12 pile so that I may actually get around to using some. It sort of worked! For any scrapbooking time, I sort through old, inherited, gifted and current photos. I pick photos that I suddenly want to use, that I'm in the mood for, and then sit in front of my 12x12 shelf and match papers to them. Once I've done that, I try to envision a sketch. More often than not, I can't. I'm not a leader in this crafting business, I'm a follower. So I use others' ideas as a springboard or for a straight lift. I make a terrible drawing of the intended sketch and pop it in the box of papers and photos ready to 'do'. set up the page, decide on photo placement and overall sketch. mat photo(s) and, using the sketch, stick it down. go through box of stickers and alphas, pull out anything that could be used. go through box of metal embellishments, pull out anything that could be used. go through box of journal tags and cards, pull out anything that could be used. go through box of gems, pull out anything that could be used. pick up box of chipboard shapes, hunt through it, pull out perfect piece and then discard in disgust. All the chipboard is naked and I don't have ANY inks or spare patterned paper to dress it. Arrange it all in a haphazard fashion that vaguely resembles the sketch and stick it down before I change my mind. I usually manage to repeat this about four times at a crop. It's not the lack of ideas that causes me to be quite slow. Nor the chatting. Or indeed the eating. It's raking through each box, each time. It's a system for using stash. And it sort of works. And if nothing else, my memory of what's in each box is improving with every crop! Sunshine is on my workdesk, gentle reader, and that makes me very very happy. Look, I've even got the stable door open. And not just to avoid showing you how the sun shows up my very poor winter window cleaning routine. This was taken last evening, about 5pm when I finally sat down at my desk for my afternoon off. Ah well, some time is better than no time isn't it! I added some journaling to a couple of layouts that I made at the weekend and that's the mess you see. The big box is the holder for photos and paper that go to crop. Ipso facto, it's where I store the finished ones till I get home. The curly bits are tape peelings, even the piece wrapped around my ATG gun....that needs refilling but I didn't want to take up valuable time doing that when I had real sticking to do! The box at the near end is meant to be metal embellishments - clips and what-have-yous..you can tell from a glance that I tidy up in a hurry at the end of a crop! Share what you're doing on your desk today will ya? Entertaining and informative - it really is. 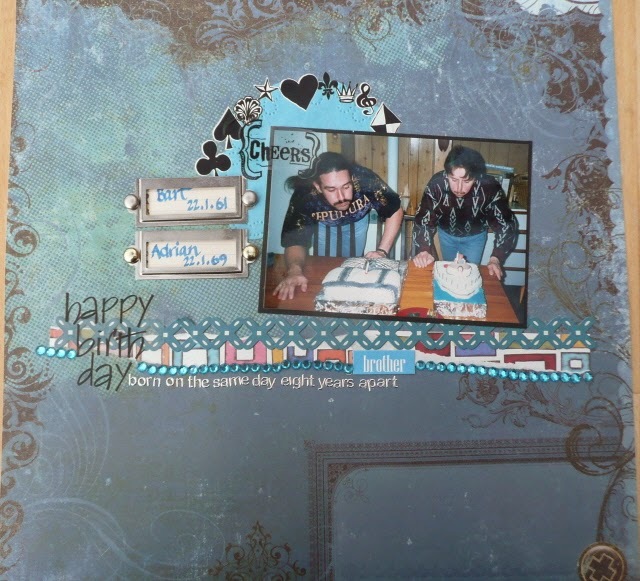 Don't forget that we're counting down to an Anniversary ATC swap, and a get-together Crop. Oh yes! I believe in my only post of last week, I bragged about having spent some leisure time at my desk last weekend. Well that nobbled every intention I had in terms of more crafting and bragging about it for the whole week. I'd like to think it was a lesson learned, but I doubt it. 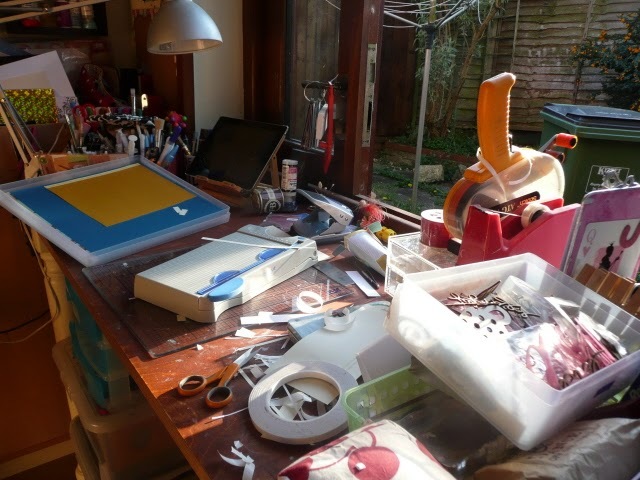 I was at the Artful Angels crop yesterday and got involved in a discussion about the intent to do some scrapbooking (or card making, or modelling, or jewellery making, or painting...you get the picture). We agreed that we all usually started a week with a plan that involves some time at our chosen hobby. And we all agreed too that as the week wears on, so the priorities change and our flexibility puts our own pleasure and hobby time below everything. Including hoovering or cleaning the loo. Charming. But true. Woodware stamp set. Love me some fruit on a stamp. No idea why, particularly! Is it because we are devoted to our families, our homes and the work that these cause create? I am a selfish human bean; I quite often find myself sorting, sanding,cleaning something and planning a meal. And then I get all tetchy about being taken for granted and not wanting to do it. And often, the answer is a simple one. So don't do it. But actually, I don't like to settle to my crafting pleasure if it means turning my back on loose ends, unfinished chores, neglected house. It means I can't spend as long as I like and lose myself for any amount of time. And it lessens my pleasure as I have to 'finish' what I'm doing to get back to 'real' work. 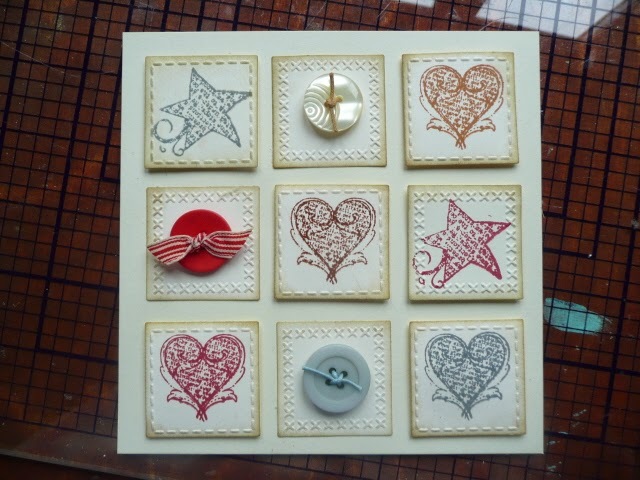 Prima stamps, cuttlebug embossing folders, buttons from my tiny collection. Reality then, is that I've been too busy to sit at my desk this week. My schedule did however, include conducting a Workshop over at Kraft Crazy - that's where these two cards came from - and a day at Crop yesterday. Any of you gals who work will totally get that if you don't schedule it, you don't do it. I think I'm lucky that I can actually schedule 'out of the house' crafting. 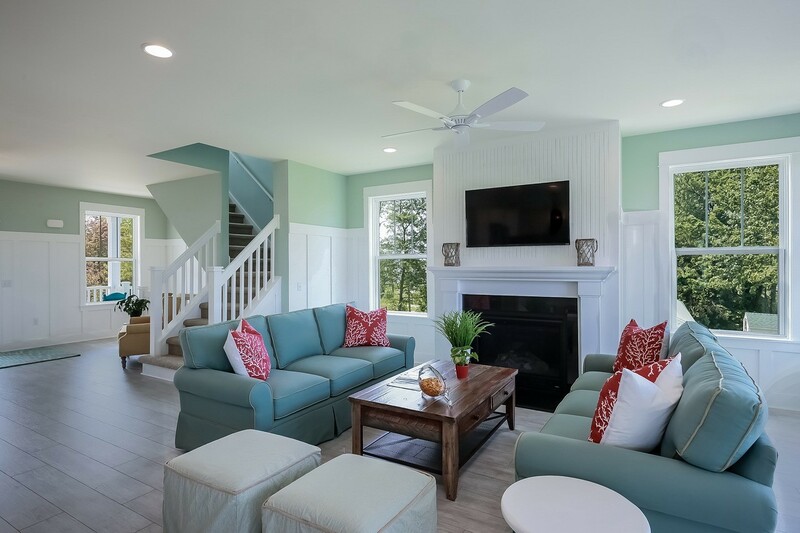 The general agreement was that if you can remove yourself from all the distractions of home and family to a crop, then you will achieve something. Because there's nothing else to do but Crop. Of course, the lovely gals I was talking with didn't include talking and eating as a part of the hobby, but I felt too shy to correct them. So that's the trick people. Forget the provision of a Craft room at home. 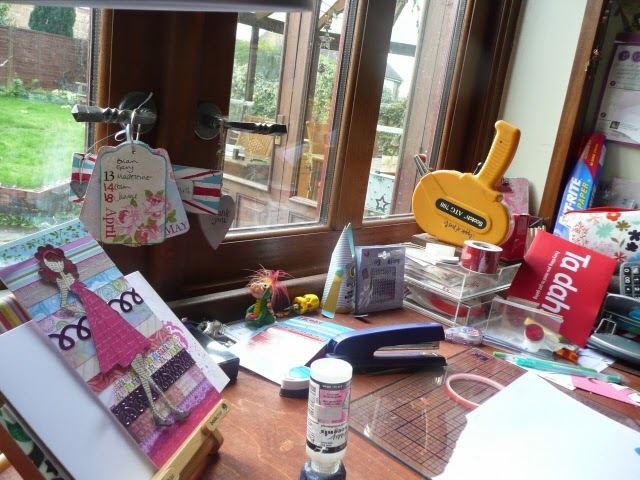 We need a Craft room in each other's houses so that we can be removed from our own domestic situations! It makes sense! We could try it. But there's a list of rules. If I cart all my stash to your house so that it's ready for me when I want to wander in and use it, I dont really want you to touch or tidy it in between. And whatever I say, I would very much rather not lend you any of my stuff unless I'm actually there. Oh, and I'll need a key - it may be the middle of the night when I finally decide to sit at my desk. And I really will need a room to myself, or it won't feel as if I've removed myself from my own environment. Perhaps you could take your family out while I'm there? Yah, I can see this working. Whaaaaaat? 306? Ouf. That means there's six weeks to go till our 6th Anniversary! Read about how we plan to share some of the things you find on our desks. So my desk shows Tuesday afternoon. It has looked like this since Sunday. 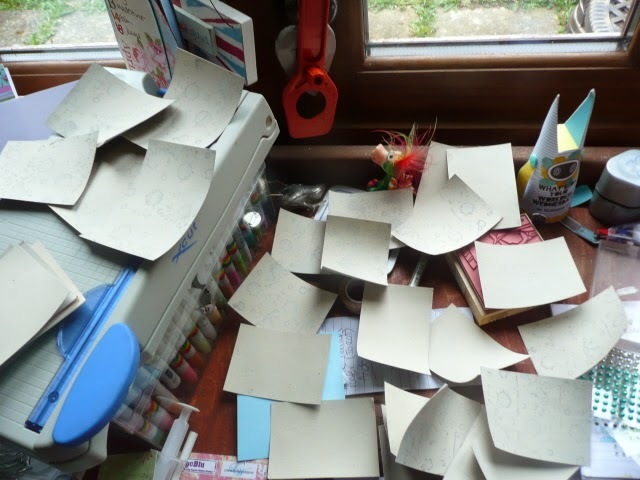 You can see...I was doing base preparations on a handful or two of ATCs. Yep, I'm trying to prepare. My desk is now cleared of such pieces, so I took another pic this AM. Still a bit gloomy. For two reasons: I need the space for workshop counting and cutting today. And.....I slept on my ATC idea and don't like it. So those bases will be filed and I will have to start over. It's OK, I'm pretty sure I've got time *cough*. So the mini cutter is balanced on top of my Copics. Out because I made some cards last weekend. 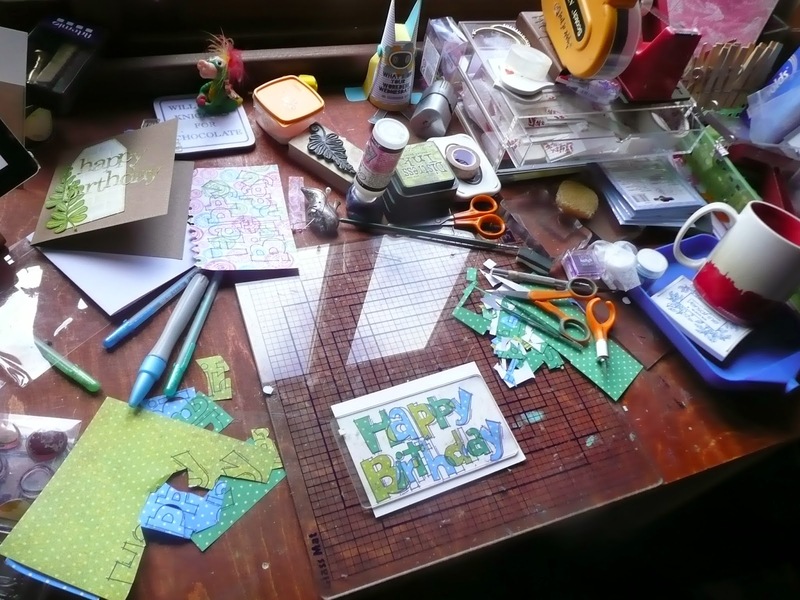 The working space is cluttered by real life diary and a batch of cards I made at a workshop I attended last week. I'll tell more about that some other time. So you see..taking the ATC blanks away only reveals that I'm prepared to work on top of stuff rather than tidy up first! I wish I could use the excuse that I was so inspired, I just had to start. But that would be a big fib! I didn't stand on a chair to take this photo - just held my camera at arms length. And as y'all know when you're a six foot blonde like I am, this sort of photography is easy. Now then, roll up and share what you're up to will ya. 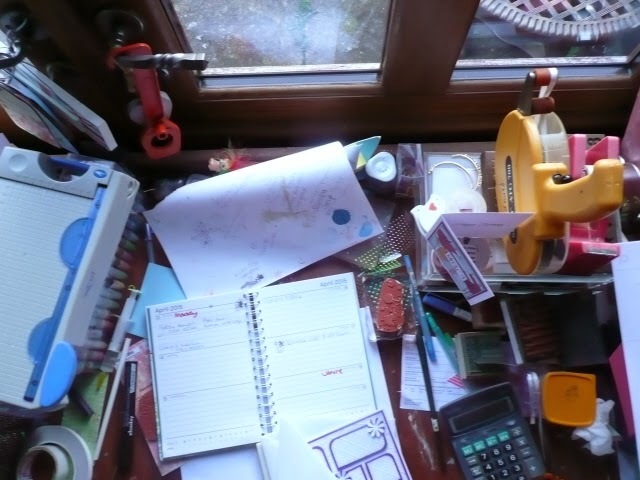 Show us your work surface and give us a bit of an explanation. We like it. Link here. We'll visit when we can! 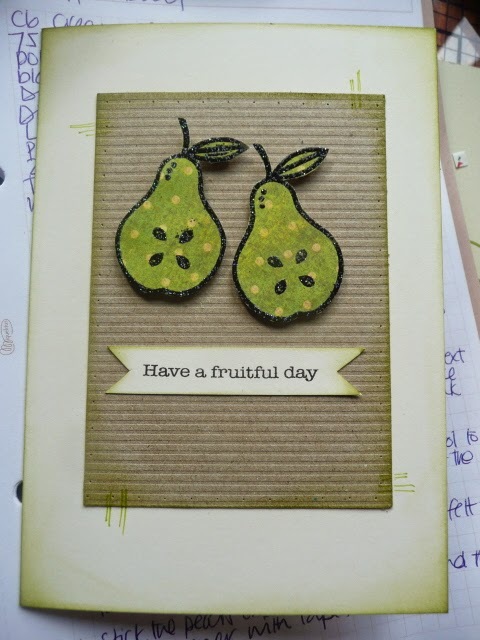 I made this card - you've seen it before - with a new set of stamps from Woodware. 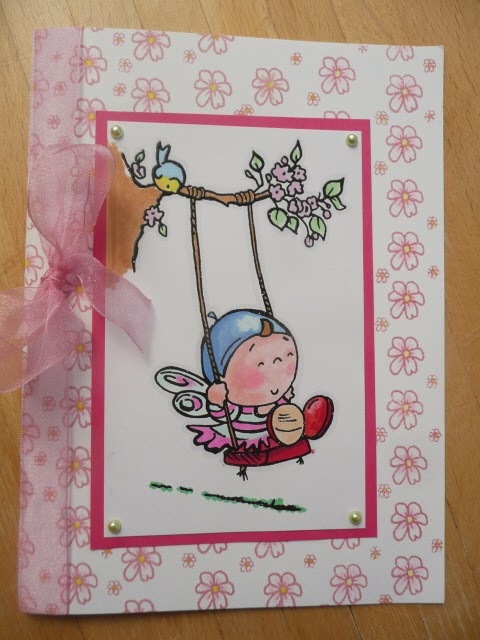 The background stamp by Creative Expressions caused a lot of interest. I like it too, but for me, it's all about those irregular big dot shapes. So then I made this because I really like the regular irregularity of the dots. And there's no law that says they are flower heads, right? This actually features in next week's workshop. Couldn't help myself. And really, that's hardly even fussy cutting. Now I seem to be seeing middle sized Woodware dots. For Grandpa's birthday card, I used it again..in multiples they're simple, cheerful and so much less stressful than choosing a 'male' card background type! The text is also Woodware (Francoise) and just involved some cutting and layering. You can barely tell but I drew round the all of the dots with a metallic gel pen to add some erm, 'zsush'. And when I say all, I mean all...even the teeny ones on the lettering! Little wonder I didn't make anything else last week! I've made even less this week, I hope to rectify that at some stage over the weekend. Have a break, people. There's a WOYWW Anniversary ATC swap coming up. I've written about it HERE. There's an WOYWW meet coming up. I've written about it HERE. There's a dearth of things happening on my desk. 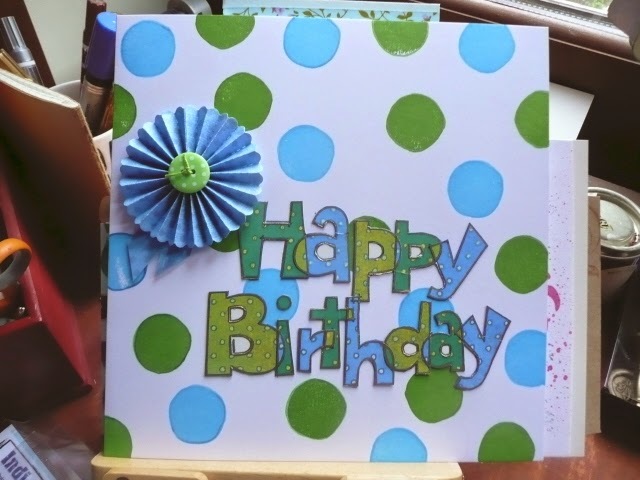 The Prima dolly is attached to a card blank covered in strips of scrap paper. When I like something, I make two and this is the second. So now it'll be an age before I put it away, no doubt. You can clearly see my birthday tag book reminding me of card requirements for this lovely Springy month. The little fimo dragon is yet to be mended. The mini screwdriver? No idea. A roll of red organza ribbon, waiting to be put away. A handful of packets of stick on gems...Shopkeeper Gal has new colours and sizes in stock - danger, danger! 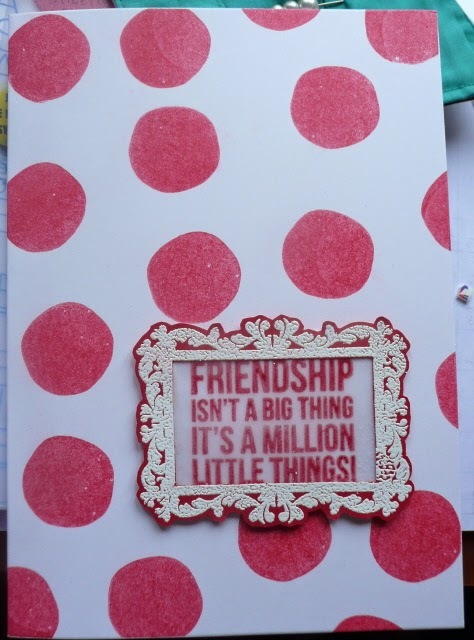 The clear stamp stained red is the irregular dot that I've used quite a lot. And the 'Ta Dah' thing is an envelope from Virgin Media containing a Sim card. I must be getting old, because the letter inside was addressed 'Hello You' and I found it a bit patronising rather than friendly and warm.....ah me. So share your far more interesting surfaces and workings with me will you.....I'm much in need of your inspiration to erm, pull my finger out and do something! You've seen this mould lying on my desk over the last few weeks. I'm a typeography sucker and Stampin' Up! knew that when they put this is their new catalogue. Of course there is a whole movement toward mixed media these days and SU! are never slow to produce a product that gets them into the mix. The mould is silicone and is every bit as non stick as it should be, am super impressed by that. It's just flexible enough to remove pieces without breaking them...and the pieces I've made have been quite brittle. I've used air drying products. First I used Crackle Glaze because for a gal who doesn't use Crackle Glaze, I seem to have a lot of it. I literally just let it run from pot to mould and fill each shape. It air dried over night and crackled beautifully..which meant of course that every letter came out of the mould in multiple pieces. Doh! So, if you want crackle effect letters, go ahead and use it, BUT add a coat of some other medium (Glossy Accents or PVA) on top of the letters to hold 'em together! 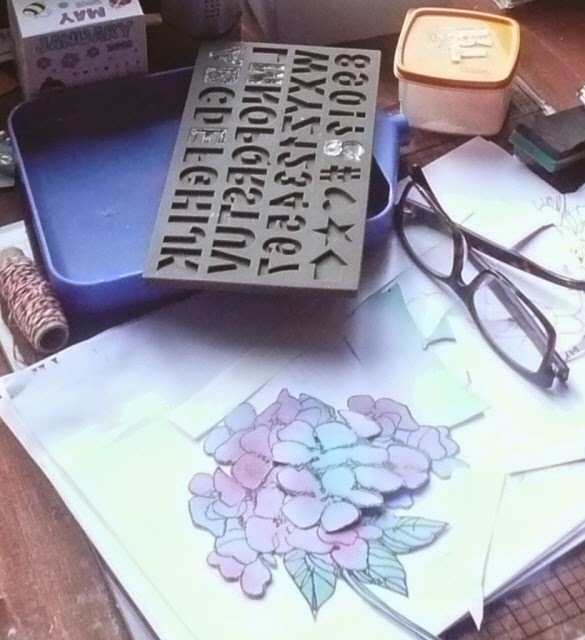 Of course, using a glue gun and drizzling in hot glue is a much quicker and cheaper way to acquire clear letters which of course you can then foil, paint, grunge..I dunno, whatever you do. These letters and the heart were made from liquid pearls. You can see that I could have put a pin in the letter shaped 'well' to break the air holes that formed - particularly in the corners. I might next time, now I know. Again the pearls had to dry overnight and of course, they are not entirely dimensional, so these letters dried to about half the thickness of the mould. Quite useful, actually. Same happens with Glitter Glue...about half the bulk is just wet glue that evaporates. At the thickest, you can create a letter about 4mm deep if you use a medium like hot glue that doesn't actually 'run' once the mould is filled. I haven't used Fimo in it yet - that's more for scrapbook titles really and requires planning and forethought and hey I'm too lazy. I like it. I consider it worth the £8, it's really durable and utterly non stick. My only question then...when can we have lower case and nicer fonts? Oh and sorry - any American readers must be driven mad by my apparent mis-spelling. Mould. It's correct here in Blighty, promise! This year's WOYWW Crop will be on Saturday 16th May, opening at 10am and closing around 4pm. It's in the same place as previous years, Burbage, Wiltshire. Jan will cook up a storm so that you don't need to bring lunch. Tea, coffee, squash will be provided too, for your liquid refreshment. I suspect that cake will be involved. The idea is that if you can come, you tip up with something crafty to do, and while Jan cooks, I run around like a Drama Queen looking busy, you do the crafty thing and chat. Chat with your neighbour, chat with me, chat with Jan, chat with fellow Deskers. Find out their real names. See that they have legs and don't just sit at computers and craft stations. It is a closed event, which means we need to know in advance that you intend to come. We don't charge a deposit and remain flexible if at the last minute you encounter a hurdle of course, but for hall hire insurance purposes (and catering too,) we have to have numbers. We make a charge per person that covers hall hire and lunch. Many of you will bring a driver and we're happy for them to have lunch too, but have to charge for it; we'll ask for half of the day cost. We don't intend to make a profit, but if there is one, it goes toward the chosen charity. We offer a raffle, donations of prizes are welcome. Profits from the raffle go to the chosen charity too. There will be a table top for selling stuff...managed and policed by each other. If you'd like to sell anything, mark it with your name and price so that each of us knows who we need to pay! We also have a link to the Salisbury Women's Refuge and will gratefully take donations of toiletries. BOGOF deals etc, unwanted gifts (surely not!). Some women really do leave their homes without so much as a toothbrush and a bar of soap to their name. This year's charity is HMSA. That's the Hypermobility Syndrome Association. Chosen to support our Zoe who has HS and has been supported by HMSA, and is crafting to raise funds for them throughout 2015. 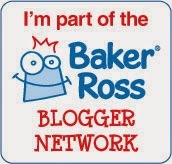 Check out her giving page HERE, and Zoe blogs HERE. You'll know her from WOYWW as the gal who can get Copics to work like no other colourer. Now all that remains to do is to let me know that you're coming please. And the easiest way to do that is to leave a comment here! It will be a pleasure to see you. And make you a cuppa. What's On Your Workdesk Wednesday. 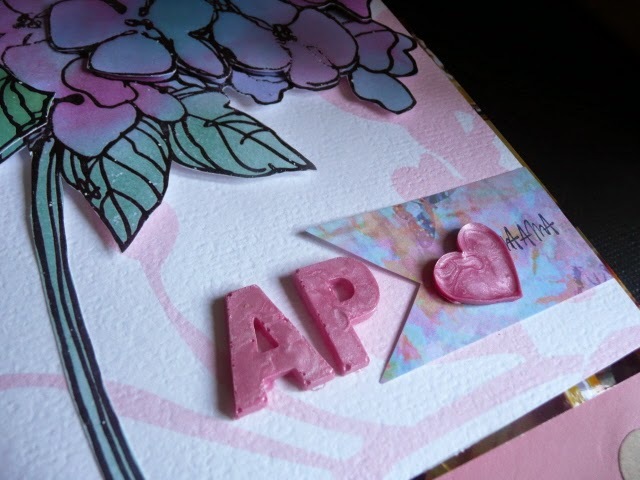 An Anniversary ATC Swap. 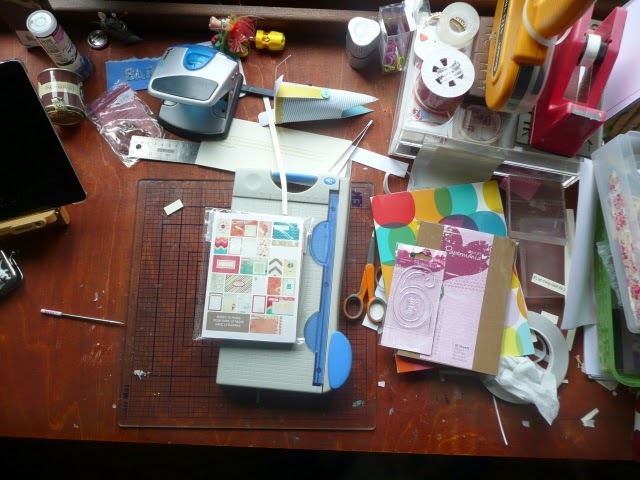 So as in previous years, if you'd like to, we'll hold an ATC swap amongst us Deskers. First, make an ATC. Then, on WOYWW 312, when you put your name on the Link list, add an asterisk (*) to it. This tells us that you are taking part. You will contact the very next name on the list that has an asterisk to get a mailing address. Send that Desker your ATC. Job done. 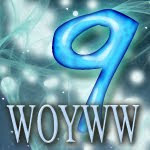 Here is a link to the WOYWW 5th anniversary post..it explains and shows and tells a lot. Now, if you're the number one on the list, fear ye not. The last person on the list with an asterisk will send to you. This makes the perfect friendship circle, don't you think. There is no obligation intended here. You DO NOT have to be a regular WOYWWer to join in on WOYWW312. If you've joined in at any stage and would like to trade an ATC for Anniversary marking purposes, then join in. Once you've decided to join in...please have your ATC ready to mail on the day that you find out your recipient's address. You must bear in mind that your receiver may well live abroad. 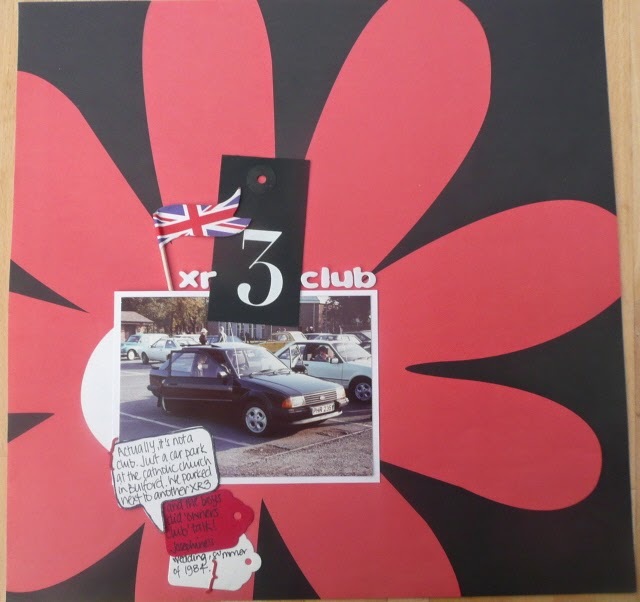 If postage costs will be an issue for you, then don't worry about joining the actual swap..just contribute to WOYWW 312 as you do any other week. Everyone understands and no one minds. Equally, if you have no time, too many commitments, awful crafter's block, PMT, no desire to join in - no problem. If your name doesn't have the asterisk against it, no biggie. Previous years, several people have made more than one ATC and offered them to other visitors - but your 'asterisk person' is the only obligation you're under once you've joined WOYWW312 and indicated your intention with the asterisk against your name. The WOYWW Crop takes place about ten days before WOYWW312. If you want to send me a bunch of ATCs for specific or random distribution to attendees, you're welcome to do so. Your obligation to sending an ATC is to your recipient. There is no need to make another one to specifically send to me. I'm a Desker just as you are and will include myself in the circle of asterisks! If you have any questions, if I'm horribly unclear..please, leave your question..I'll respond personally unless loads of you ask the same question..in which case I'll update this article! Now..off and design your ATC. And LLJ....come over here so I can make fun of you playing with paper and ink! Supreme in afternoon sunlight, here is my desk at Tuesday afternoon. It was a stroke of genius actually, taking the photo then. See, I was at work with Mr Dunnit and had to come home to collect some drawings with necessary dimensions that he'd forgotten. It occurred to me to snap the desk in daylight as I knew it wouldn't change. Glad I did, because we ended up doing overtime and I crashed into my arm chair when I got home and didn't leave it till bedtime! I'm working on a card for Grandpa's birthday. At this point, you can see, I've cut out all the letters and bits for overlapping letter contrasts. They are yet to be stuck down. And because I have NO intention of cutting any of them out for a second time, I've put an acrylic block over them so that people can come and go within the range of my desk and the pieces won't be lost ripped, bent or fly away. The indelicately balanced mug is, I promise, totally empty. Someone asked what the pegs are for - holding small bits while I heat gun them, as 'clamps' for gluing difficult things...that sort of thing. So now, share please; it's always lovely to see what you're up to. 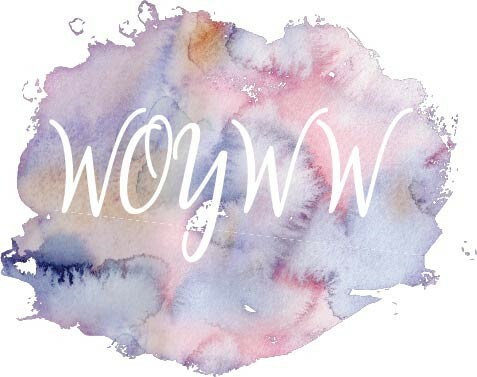 Please put WOYWW in your blog post title and link yourself here. Lovely. Thank you. In 8 weeks people, it will be WOYWW 312; that will be the sum total of SIX years of us WOYWWing. Being Deskers. That's Wednesday 27th May for those of you who go by calendar dates and not WOYWW numbers. So we'll attempt that friendliest of gestures - an Anniversary ATC swap. I'll write a post about it separately so as not to bore the glue off your paper at this point.